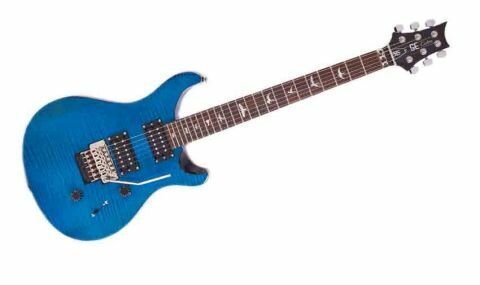 Usable for so much more than the rock and metal a Floyd Rose implies, the 'Floyd' Custom 24 is yet another addition to the PRS rack of greatest hits. Floyd Rose works superbly. Top build and tones. Since 2001, PRS's Korean-built SE series has been providing Paul Reed Smith's high-class instruments at mid-range prices. The SE 'Floyd' Custom 24 debuted alongside its American-made big brother at NAMM 2014, and if that big hunk of metal hadn't already given it away, the differentiator with this Custom is a Floyd Rose locking vibrato. The whole package doesn't look quite as outlandish as we'd expected, though - the well-proportioned body and smooth curves fuse with the Floyd to form one seriously high-class rock machine. The other specs of note are the finishes: there are seven of 'em, although Sapphire, Grey Black, Emerald Green, Amethyst, Black Cherry and Tobacco Sunburst are limited to a mere 50 models each in Europe. The Sapphire we have here makes us want to go for a dip in the lush ocean-blue lacquer - and with that Floyd Rose, diving is this guitar's speciality. "From the endlessly playable Wide Thin neck to the PRS machineheads, the 'Floyd' Custom 24 is pure class"
Sling the 'Floyd' Custom 24 round your shoulder, and your first instinct will be to hit a chord, grab that whammy bar and give it a good yank. We're no different, and this Floyd rose to the occasion, handling a wide array of dive bombs and Satriani-style vibrato histrionics with ease, never once threatening to slip out of tune. It's smooth all right, just like the rest of this guitar; from the endlessly playable Wide Thin neck to the PRS machineheads, the 'Floyd' Custom 24 is pure class. The tones continue the playability's good work. The ever-popular SE HFS Treble and Vintage Bass combo fills the bridge and neck pickup cavities, and offers a wealth of classic sounds, thanks to a cunningly installed coil-split activated via a push/ pull pot on the tone control. The Vintage Bass is warm and evocative, ushering in smooth octaves and open chords,while there's plenty of rock aggression available from the HFS. Kick in the coil-split and you get an increased treble spank, which is remarkably convincing for Strat-a-like tones, reinforcing the Custom's Gibson-meets-Fender ideals. Maybe the overdriven split-coil tones are a little overbearing when compared with real single coils, but really, that's splitting hairs. Whack on some distortion, and the 'Floyd' transforms into a roaring rock dragon, with enough 'bucker-loaded output to sustain your wildest lead-based fantasies. We're running out of Best Buy badges to throw at the SE series. No matter what tweaks PRS makes, the Custom 24 remains a refined, classic design, from that lower cutaway carve to the tonesome pickups, and the locking vibrato makes for a surprisingly coherent fit.